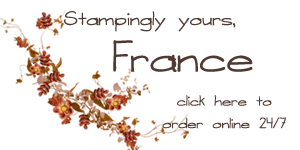 Welcome to to the Dozen Stamper’s Blog Hop. This month theme is Spook-tacular and for my take I use the Curvy Keepsake for treat box. They are so ugly that they are cute. I did a video last Friday for tip on how to use this Curvy Keepsake box to view CLICK HERE. The pumpkin one I use the Tangelo Twist, love that color for pumpkin and if you are wondering what I use for the lines on the pumpkin well it’s a stamp from the set Gorgeous Grunge. Both of the greeting are from the set Good Greetings that can be yours for free with qualified workshop or order of 300.00. For Mr.Frankenstein for his lovely hairdo I use a piece of basic Black card stock about 2-1/2 by 3 but I had to give him a big trim so I would day 2-1/2 by 2 would be great so you don’t have to cut to much. just cut some curvy V for his bang and VOILA! Well this is it for my take but make sure to go hopping to see many great Spook-tacular creation. Have a great day!!! Oh my, these are just adorable! Thanks for showing them to us! Adorable! Thanks so much for sharing, Frenchie! too cute, Frenchie; thanks for the share! Love these Frenchie! Great job as always. I came across these on Pinterest. I LOVE them especially Frankenstein's monster! Thank you for showing how you did the hair. I'm hooked on these little Curvy Keepsake box ideas! Thanks so much for sharing!